Note… I wrote this post back in December of 2011 but never published it – with Easter tomorrow I figured it might be a good time to post it finally. Not healthy by any means but ah well! A second take on the lazy ladies fudge this holiday. I use Solo Marshmallow Creme as it comes in recipe ready 7 ounce tubs and has no artificial coloring added (Kraft’s has Blue added). I can sometimes find it at Dollar Tree stores so I always check during November/December! Have all the ingredients measured out. Line an 8×8″ glass baking dish with parchment paper or foil, set aside. In a tall and heavy saucepan add the sugar, milk and 1 Tablespoon of the butter. Put over medium-high heat, stirring gently until it boils, bring up to 233°, add the remaining butter (cut up a bit) into the hot mixture (use a spoon to do the transfer so you don’t splash yourself!! ), stir till melted and the mixture has come back to a full boil. Turn off the heat, add in the remaining ingredients and stir quickly until the marshmallow is fully incorporated. Scrape into the prepared dish and knock the dish gently to evenly spread the fudge. Let fully cool down, you can refrigerate to speed it up. Pop out the parchment paper and peel off. Cut with a large smooth knife or pizza cutter into pieces. Store tightly wrapped and refrigerated for best results. 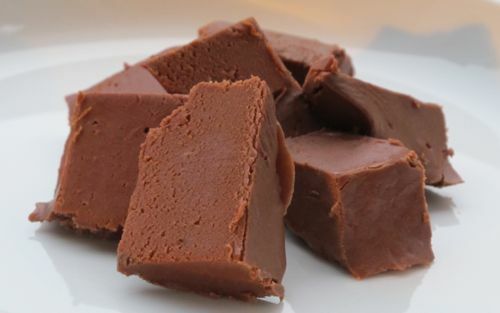 I love the “easy” aspect of a fudge recipe~meaning I will try it:) Thanks for the post!